We heard our member's requests for a structured business referral network dedicated to building business relationships within the BHBA community. 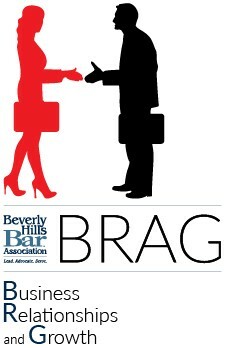 BHBA BRAG (Business, Relationships and Growth) is an exclusive networking group created by the Beverly Hills Bar Association to promote direct networking and client referrals between BHBA members. BRAG meets monthly and emphasizes client acquisition and business development between attorneys in different practice areas, in firms of various sizes. This commitment will facilitate strong relationships which are the core to quality referrals. Each BRAG group will have a limited number of practitioners in specific practice areas. As BRAG grows, additional networking opportunities will be added. Space is currently limited so please respond ASAP. The BRAG Lunch Group meets on the 3rd Monday of every month (subject to Holidays). How much does BRAG cost?